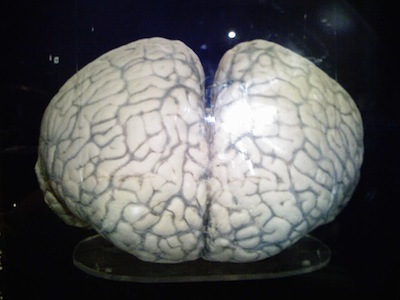 There are many studies out there that compare the size of brains from one living thing to the next. What has been found is that the size of the brain for a human and a dolphin are almost the same. This is based on information that shows the evolution of the cetacean brain over a period of more than 47 million years! Such studies have given experts information about the large size of the brain for toothed whales. Some of these species have abilities that have only previously been seen to exist in some of the Great Apes as well as humans. Now they have also been observed with some of the species of dolphins. Brain of Pacific white-sided dolphin / Author: Tranletuha. There are studies that show dolphins have the ability to recognize who they are when they see their reflection in a mirror. They are also able to communicate using symbol based programs and through concepts that are abstract in nature. Some researchers believe that the large size of their brain is what allows such intelligence to occur. Yet what continues to be a huge mystery to the experts is the evolution of the brain over time. One of the largest fossil studies that has ever been conducted has been done by Lori Marino has several of her colleagues from Emory University in Atlanta. The study spanned 4 years looking over various collections in different museums. The team used 66 different fossilized cetacean skulls that they found. Using CT scans, they were able to document the size of each of the brains. They were also able to document the body mass through the bones found at the base of each skull. This study also included looking at similar data already collected on 144 cetacean skulls. This resulted in a total of 210 samples being looked at, with 62 species and 37 different families being represented in that total of samples. Find the EQ, or Encephalization Quotient, of each one was the purpose of collecting such data. The largest of all creatures is humans with an EQ of 7. There have been two significant points in the evolution of cetacean that the EQ showed a significant jump. The first dates back about 35 million years ago. There were dramatic changes to the EQ as well as to changes in body size. There are studies that indicate the development of larger brains was the result of the evolution for echolocation. This is the use of high frequency sounds that can be picked up as they echo off of various objects. Then the animals are able to interpret a variety of information from that occurrence. It is believed the second dramatic increase in brain size occurred about 15 million years ago in the Delphinoidea super family. This includes narwhales, belugas, dolphins, and porpoises. The information from fossil records suggests that these increases were significantly more than that of humans or great apes. The findings of this study are believed to be one of the few that have helped us to gather such information from the fossil records. Such research is time consuming but it is also very important as well as interesting. If you are interested in reading more about the research this team has done, it will be in The Anatomical Record, December issue.